The European Union said it did not expect the timeline for negotiations over Britain's exit from the bloc to be affected by the British government's call for an early general election. British Prime Minister Theresa May called for a snap election in a surprise move as Britain prepares for delicate Brexit talks. 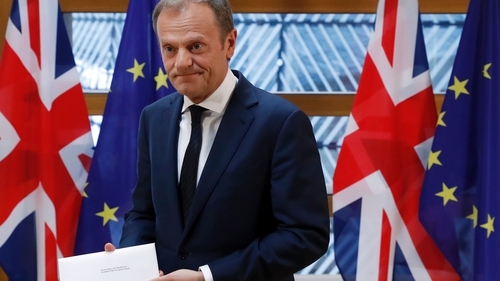 "The UK elections do not change our EU27 plans," said Preben Aamann, spokesman for Donald Tusk, president of the European Council of member states. "We expect to have the Brexit guidelines adopted by the European Council on 29 April and, following that, the Brexit negotiating directives ready on 22 May," Mr Aamann said. "This will allow the EU27 to start negotiations," he said. Mr Tusk issued a set of draft guidelines late last month rejecting Ms May's call for talks on the terms of the divorce bill and on a future trade deal in parallel during the two years of negotiations ahead of Britain's exit in March 2019. The remaining 27 EU countries are set to rubber-stamp Mr Tusk's guidelines at a summit on 29 April, paving the way for chief Brexit negotiator Michel Barnier to begin formal negotiations with Britain at the end of May. Mr Tusk said in a tweet that he had had a "good phone call" with May about the coming British elections, following her announcement in London. The election announcement was perceived positively in Brussels, European sources told AFP on condition of anonymity. "This is a domestic matter for the UK. But we have some hope that this will lead to a strong leader in London that can negotiate with us with strong backing by the electorate," a European source close to the negotiations said. "This does not change things. We are ready. Early June was always the calendar" to start the negotiations with London, the source added. A diplomat from an EU member state added that Mrs May "is completely right to call these elections now" as she could benefit from a favourable political context. "The good news on the European side is that she will be less weak to make all the concessions she will have to make" in the talks, the diplomat said, adding that such concessions would be harder to make before an election.